With Glittering Eyes: Moments of Joy. I love moments of pure joy. They are rare, and when they occur they are so blissful and rich that I try as hard as I can to relish them. Lately, I've been doing a little mental inventory of these times. What better way to document them than here on my blog? The first moment of completely pure joy that I would like to share occurred last summer. 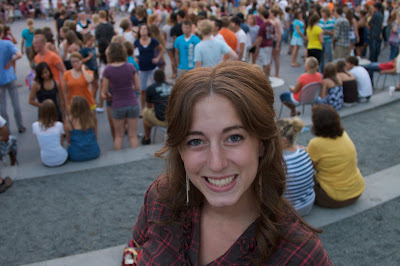 We took some of our teens swing dancing in downtown Grand Rapids. Josh and I enjoy dancing and we've learned a few different dances together. A dance that we've never formally learned, however, is the Polka. Well, on this night during swing dancing, they played a polka song. Suddenly, everyone started polka-ing. and by everyone I mean, there were AT LEAST 500 people on the dance floor. I'm not exaggerating. Josh and I happened to be on the sidelines at this point when he suddenly grabbed my hand and said, "Come on! Lets go polka!" Needless to say, we just dove straight into the crowd and hopped and spun the song away. Everyone was going at a very fast pace in one circular direction and I was just laughing so hard being twirled and spun around by the love of my life. 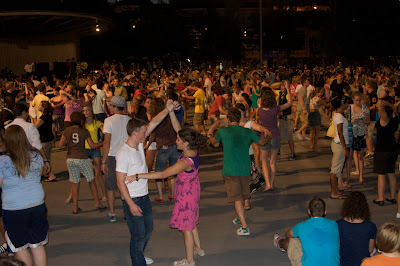 We were completely lost in a crowd that was completely lost in each other and no one really knew what they were doing but everyone spun and danced like a giant whirlpool of dancers in the middle of downtown Grand Rapids. and I had a sense of complete joy. Everything was right in the world in that single moment. Do you notice moments like this in your life? I hope you do. I hope to fill a journal some day with stories and pictures of joy-filled moments like this one, where I fully experienced the richness that life offers, and relished in each second of it. I told you I wasn't exaggerating about the 500 people!